Innovative elegance. 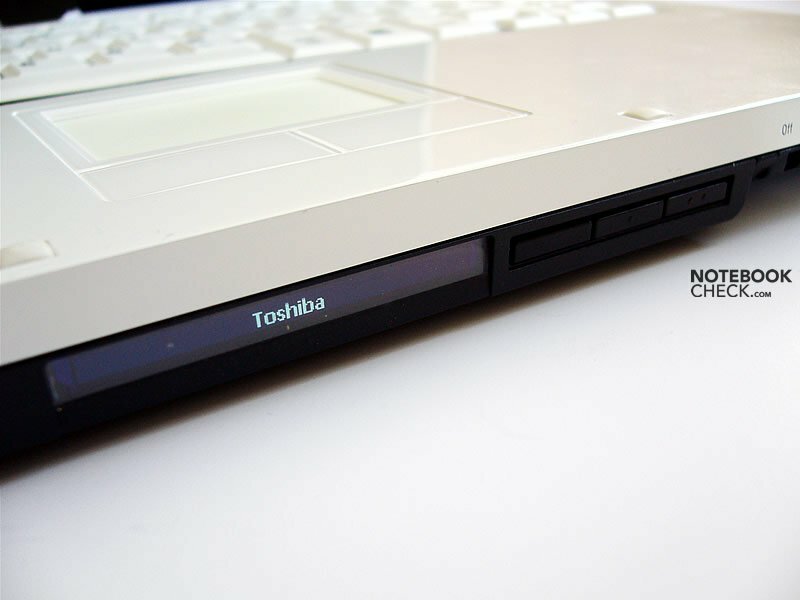 Toshiba's Portégé R400 provides leading edge design and functionality. 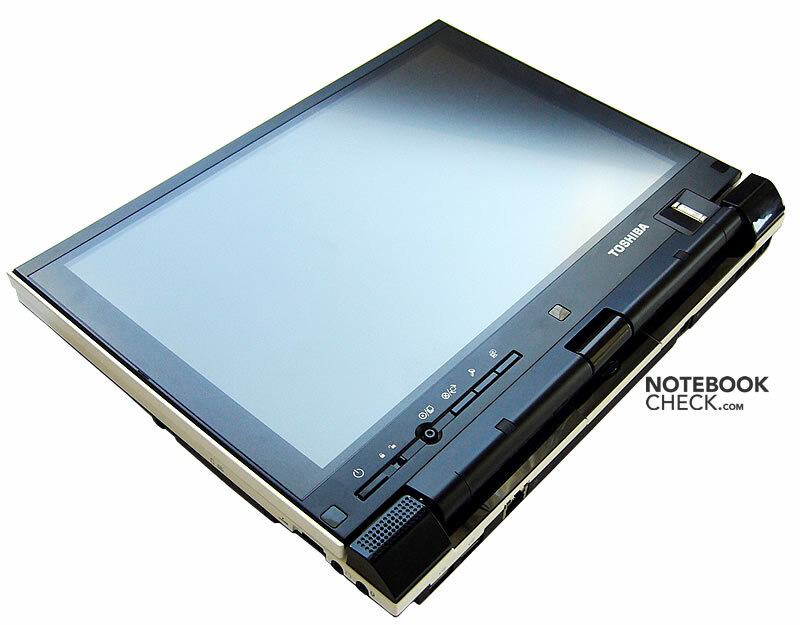 Designed in cooperation with Intel it is a very light 12'' widescreen Tablet PC with LED back-lit screen. 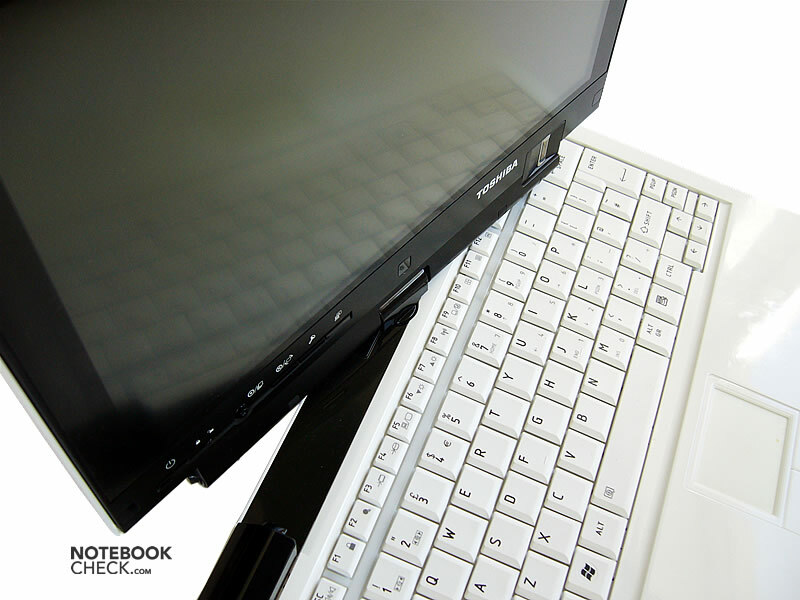 It is the first notebook with automatic e-mail synchronization notifying the user in real time on a special display located at the computer's front side. Interested in an innovative Tablet PC? - Please read on. 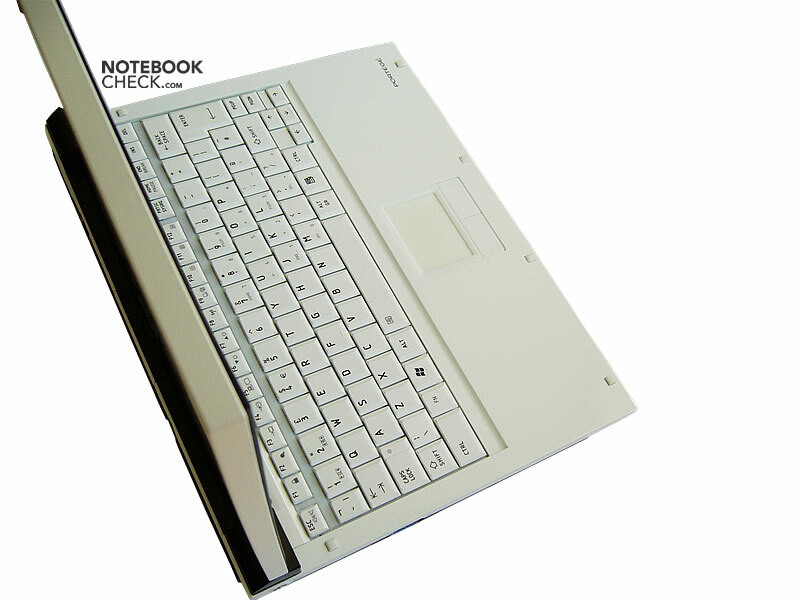 Following review is provided by notebookcheck.pl, our Polish editor team. 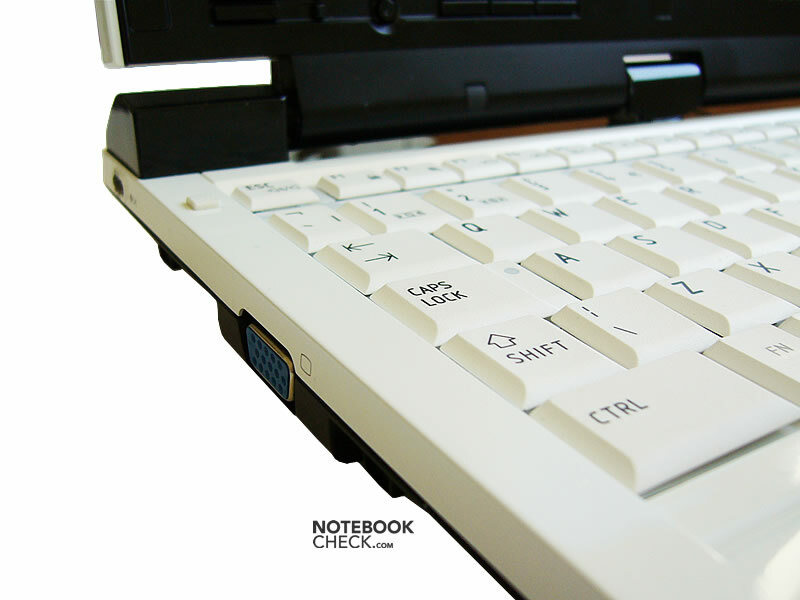 The Portégé R400 is an almost perfectly designed laptop. 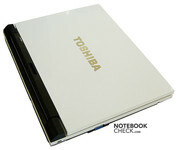 At its front side it provides a small LED display called Toshiba Edge. Utilizing Windows Vista's Active Notification Technology it displays useful information like the wireless signal strength, the number of unread messages in the inbox, or the next entry of the organizer even if the computer is hibernated. 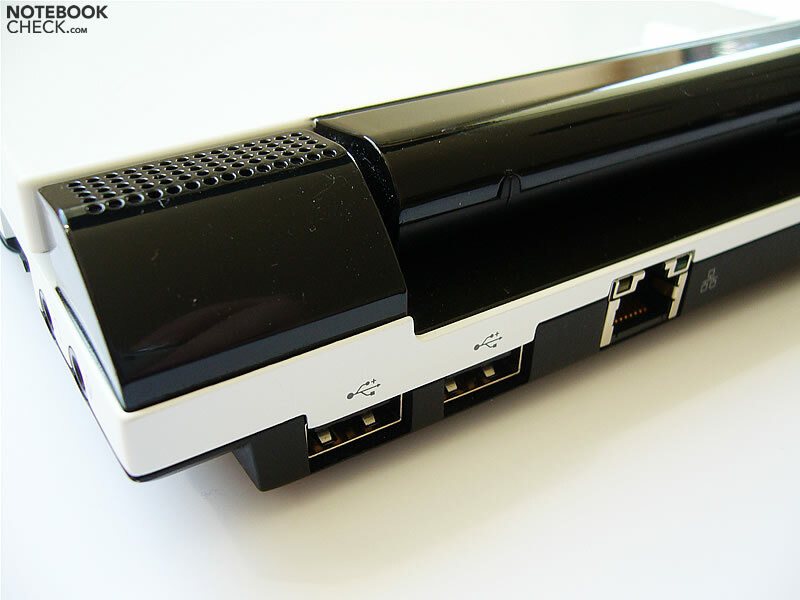 The Portégé R400's white case and black screen frame catches the eye. However, the coating is sensible to show signs of wear. The R400 is very light. 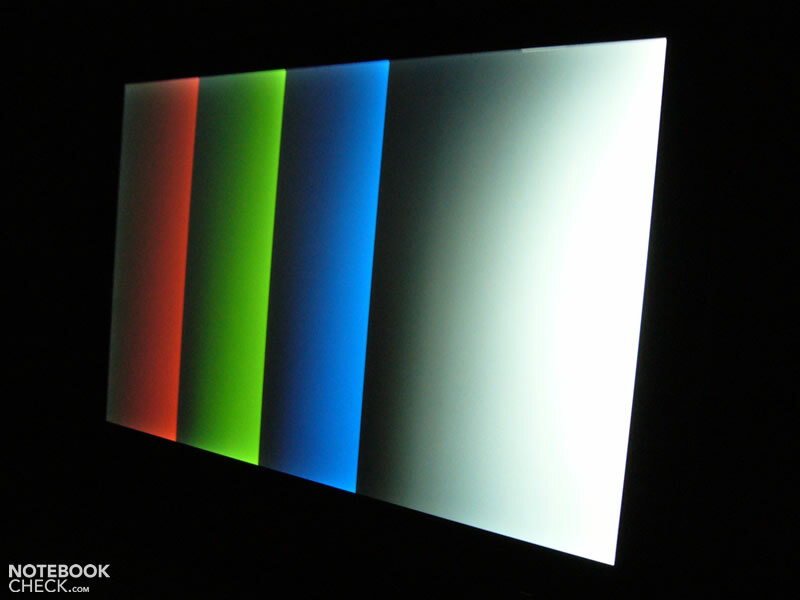 However, although LED lit its display is relatively heavy. During carrying the open Tablet PC, it seems as if it could easily overbalance and fall down. A shelf at the backside, which can be used like a handle helps carrying it. In total the case is rather solid. 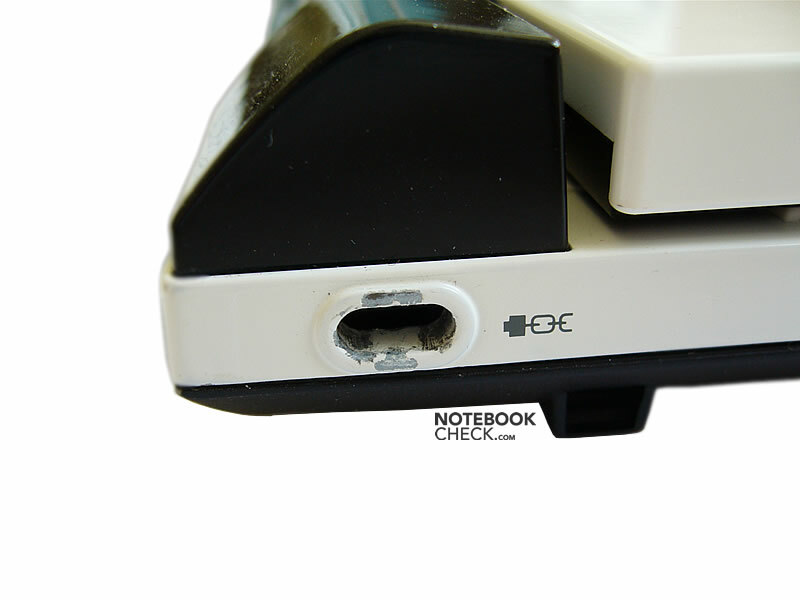 Although the plastic at the bottom side is first class, it gets evident at a closer look that the cover of the supplementary battery slot slightly wobbles and clatters when the user handles or manipulates the Tablet PC. The display cover yields under pressure. For volume control a little lever is provided at the right flank of the base unit. It works like a zoom toggle in digital cameras, and is very user-friendly. The R400 has three hinges, the middle one can revolve, the other two are partly hollow in order to allow turning the screen around the pivot. In standard Laptop position the display see-saws a little after adjusting its position. The Portégé R400 lacks a latch, which would hold the folded display steady. Instead the locking mechanism works like this: Once closed to about 30°, the display is automatically moved in, audibly dropping to the base unit. Furthermore, it is not easy to disjoin the battery. 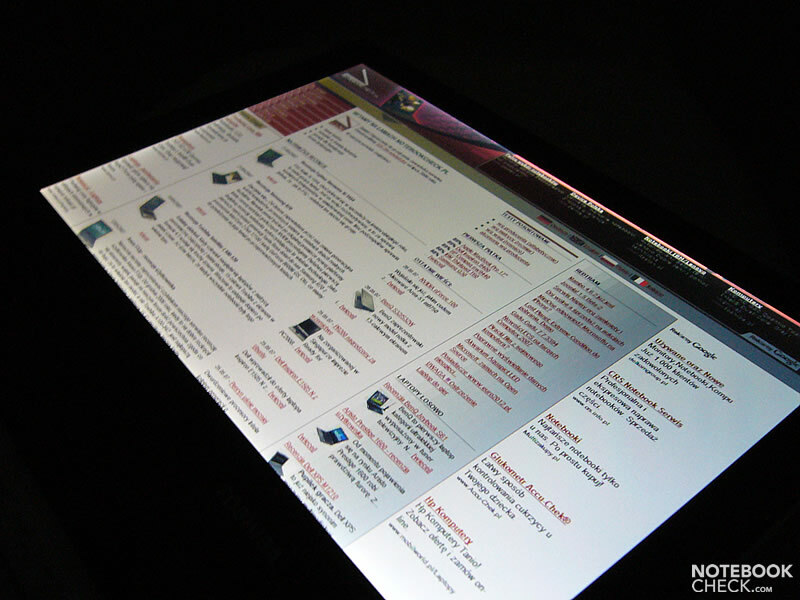 Typical Tablet PC, the Portégé R400 unfortunately provides very few interfaces. There are only two USB ports placed next one to another. Considering the R400 is a Tablet PC the keyboard is not that important. 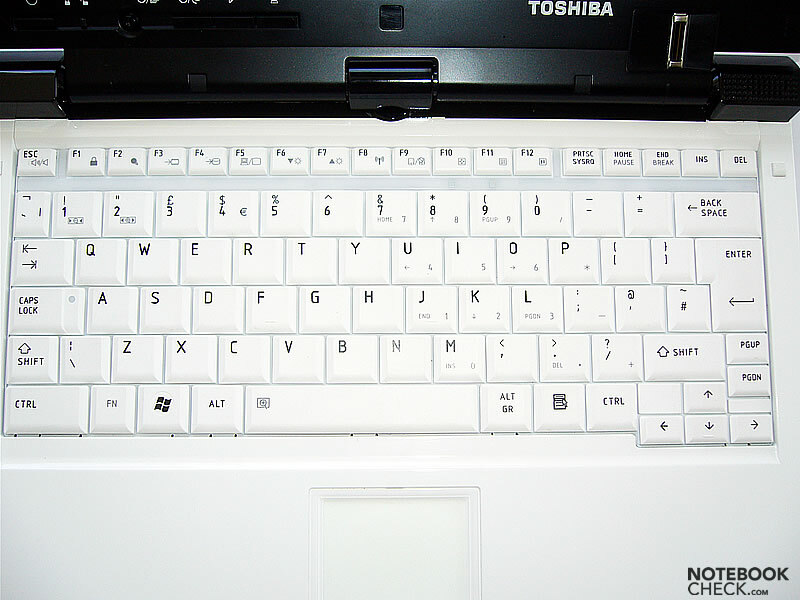 Due to its overall size, the keyboard is also rather narrow and some keys had to be shortened. Typing is characterized by a short, maybe too short, travel and a normal stop with hardly any feedback. 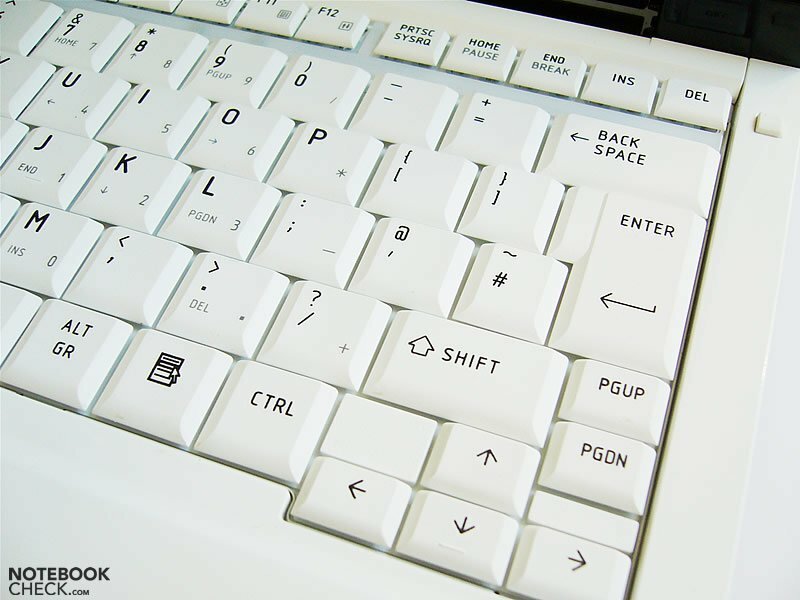 This allows fast and quiet typing, but omission mistakes are more likely. 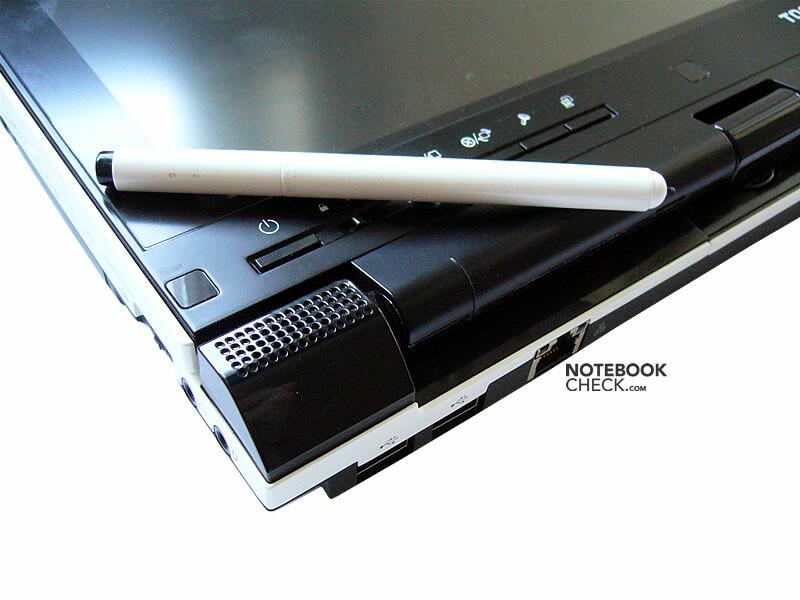 As it is a Tablet PC, you might prefer to use the stylus in very quiet environments. Although the keyboard yields a little in its center, this is so minimal that you'll hardly notice it. The touchpad is very small and not sufficiently precise. Its buttons are almost noiseless, the left one is a little louder. Besides the usual input elements the R400 provides some hotkeys for controlling it. The power switch next to them is a little too small and hard to push. 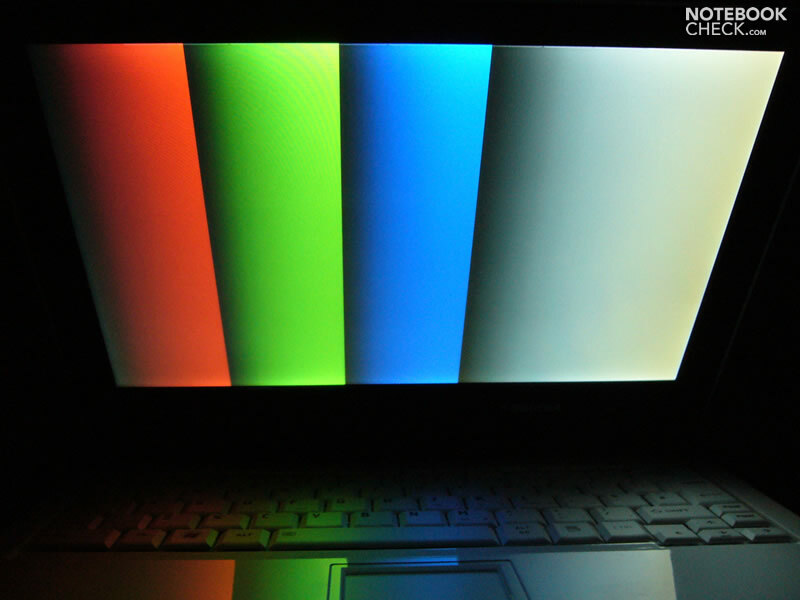 The Portégé R400, first showcased in January 2007 at the CES in Las Vegas, is the first of Toshiba's notebooks with LED backlighting. 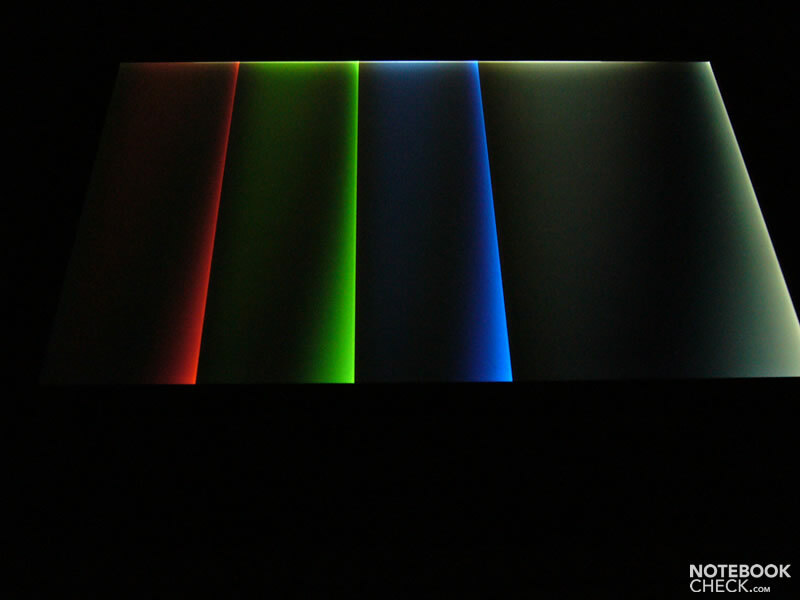 So, it is one of the first offering this display technology (long after Sony, and almost concurrently with Asus, and Fujitsu). 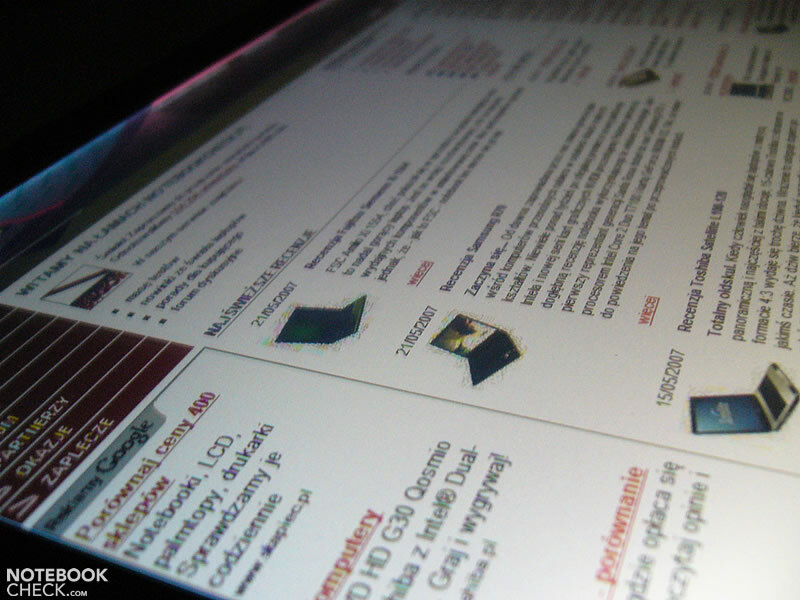 As far as we know, it is the first convertible Tablet PC with an LED-backlit screen. 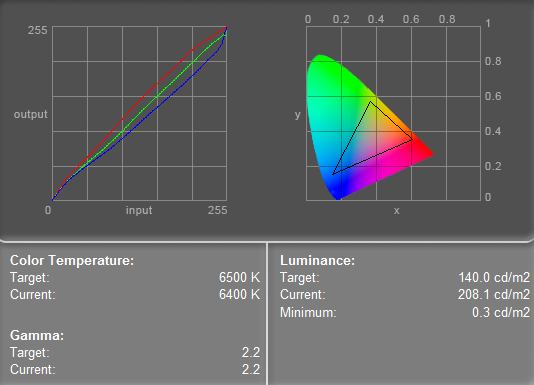 The 12.1" WXGA (1280x800) display has a matte surface with good parameters. Its maximum brightness amounts to 225.7cd/m². 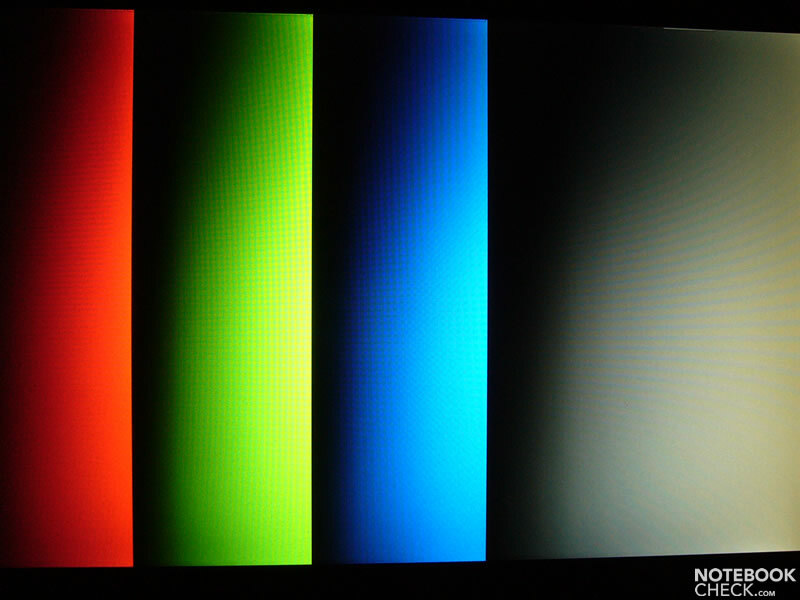 This small screen is evenly illuminated (87%). The maximum contrast is also excellent - its value reaches 564:1. The viewing angles are not extremely narrow, but also not outstanding. If you are looking for a Tablet PC and the R400 and the Asus R1F are shortlisted, you might prefer the later one, because of its superior stability to the vantage point. 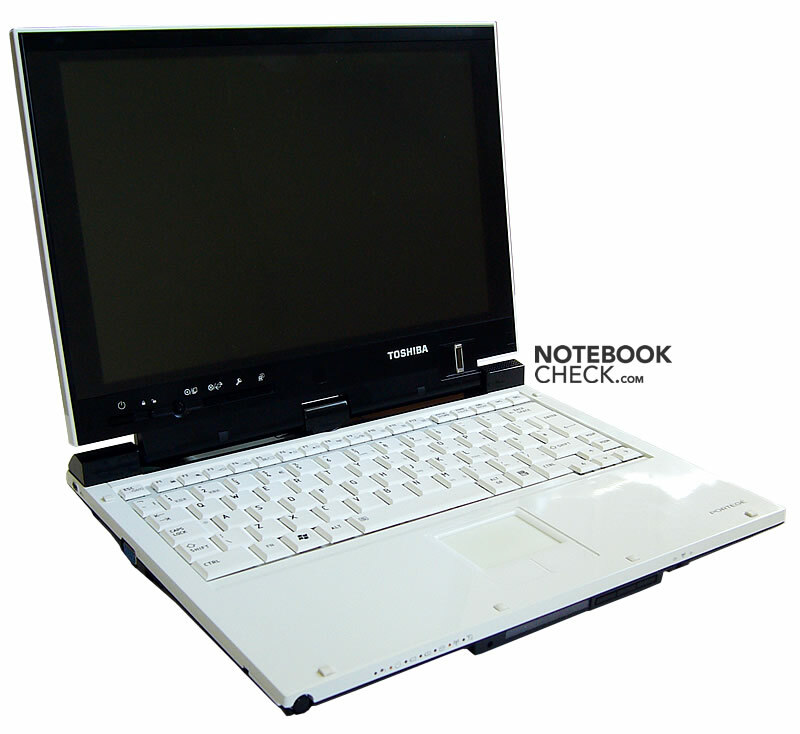 The Toshiba Portégé R400 is equipped with an Ultra Low Voltage Core Duo U2500 processor with 1.2GHz clock rate. Its TDP (Thermal Design Power) amounts to 9W. 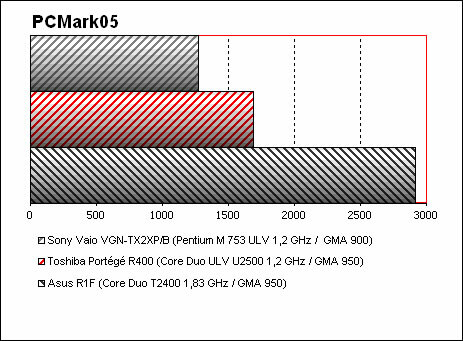 In the benchmarks this CPU achieves considerably better results than the Pentium M ULV, but rates worse compared to Core Duo CPUs which use standard voltage. Graphics is done by an integrated Intel GMA 950 video card. The Toshiba 80GB (4200rpm) harddisk is slow, but its power consumption low. Note: This laptop has no integrated optical drive. After turning the computer on, it's fairly quiet, audible only in low-noise environments. Some time after booting Vista, you can hear the hard disk operate, even without load. After no more than five minutes (still in idle mode) the fan starts running at maximum speed (38.3dB) and works thereafter without interrupting regardless of load. Considering that a convertible tablet PC is supposed to be used anywhere, also in very quiet environments, the noise level is quite high. Despite of a permanently working fan, the case gets considerably warmer. In this aspect the Portégé R400 reaches the record of the Apple MacBook 13" which is equipped with a regular Core Duo CPU whilst the Toshiba comes with an ultra-low voltage version of this processor. The maximum temperature on the top side exceeds 42°C, while at the bottom, it gets close to the 50°C barrier (we measured 46.5°C). 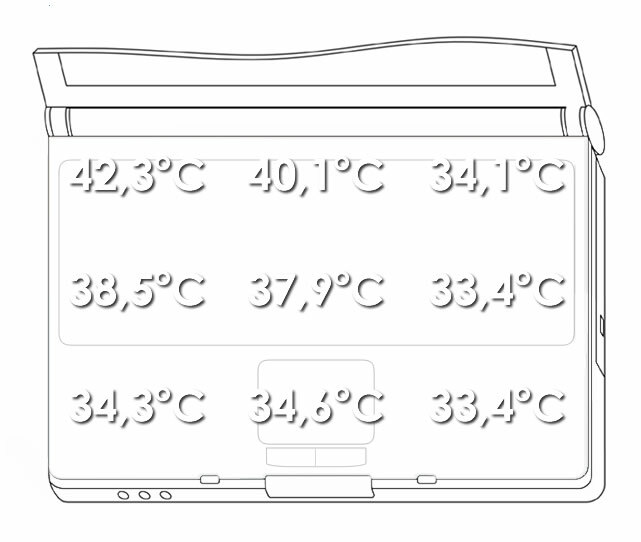 High temperature emissions are the usual drawback of slim cases. The mono speaker sounds poor. Its maximum volume is low, and the mono sound is just alright for listening to news. Despite of a low voltage CPU (U2500) and a LED back-lit screen, the runtime achieved with the 4000mAh is not outstanding. The battery runtime is between an hour and three quarters and a maximum of about three and a half hours. 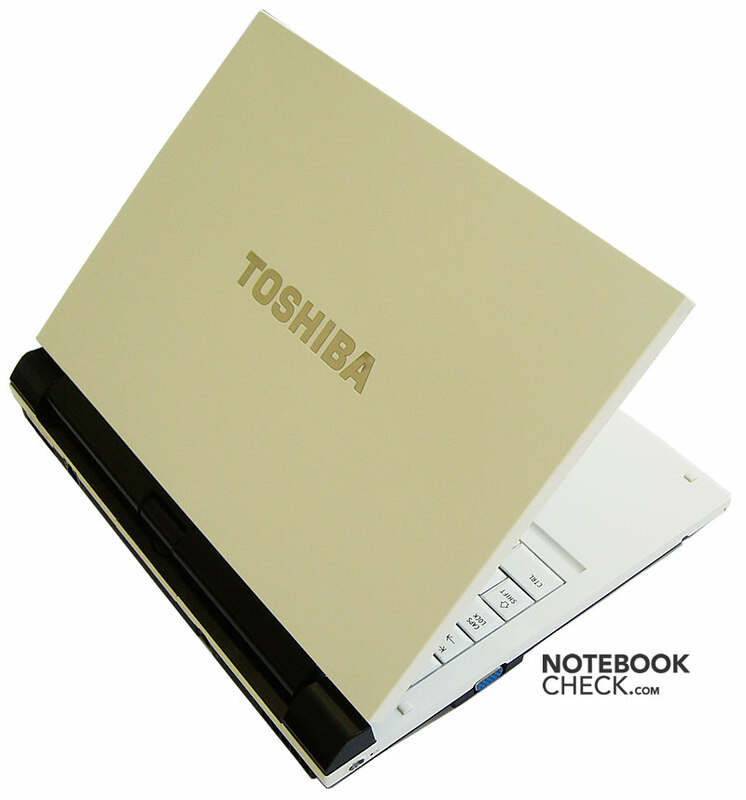 The cooperation between Toshiba and Intel proved to be a good one in case of Portégé R400. 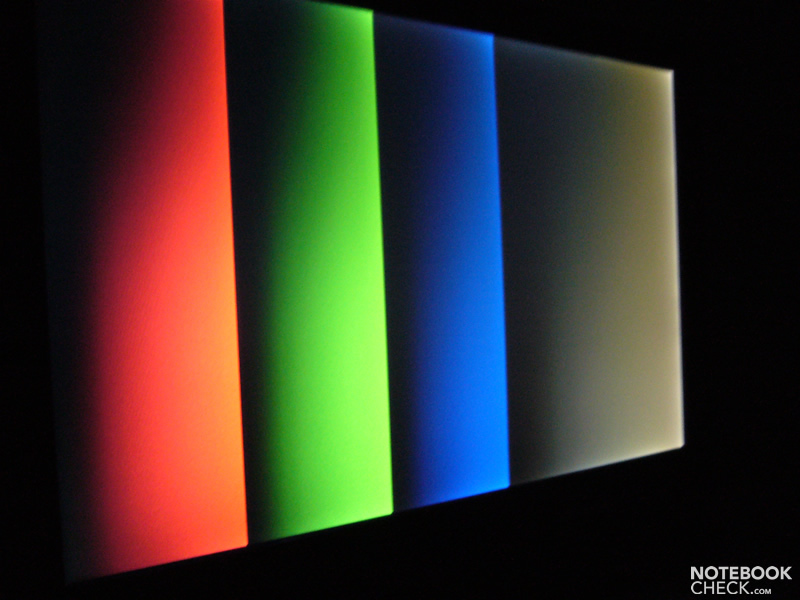 The LED-backlit screen is alright. The Wacom stylus can be handled easily. We liked writing with it, but it's not so good at drawing and precisely pointing at the screen. Features: marking objects at a distance of 2-3mm from the screen, long- and short-touch contact and a side button corresponding to the right mouse button. It is configurable according to your needs. Windows Vista Ultimate can be fully controlled with help of the stylus... well, maybe with a little help of the virtual keyboard, too, which is always at hand. The Tablet PC also enables an alternative way of login, which is demonstrated in the video clips below. The first one illustrates how to teach the machine the way the user writes his/her password; the second one shows the reaction on wrongly entered passwords. We can confirm that entering the password with another hand leads to an error. Besides a nice outlook, this notebooks impresses by sophisticated design. Complaining about the low performance of Portégé R400 is not justified, because the main purpose of this notebook is simple office tasks, e-mail or keeping an eye on the share prices. As a Tablet PC, it is not supposed a computer for professional graphic designers, but rather a handy organizer for a CEO. It allows the users to take notes with a stylus, respond to incoming mail, or edit documents in a way more user-friendly, especially for those not used to keyboards. We can confirm that coming back to the keyboard after spending some time with the pen and the tablet might be difficult. 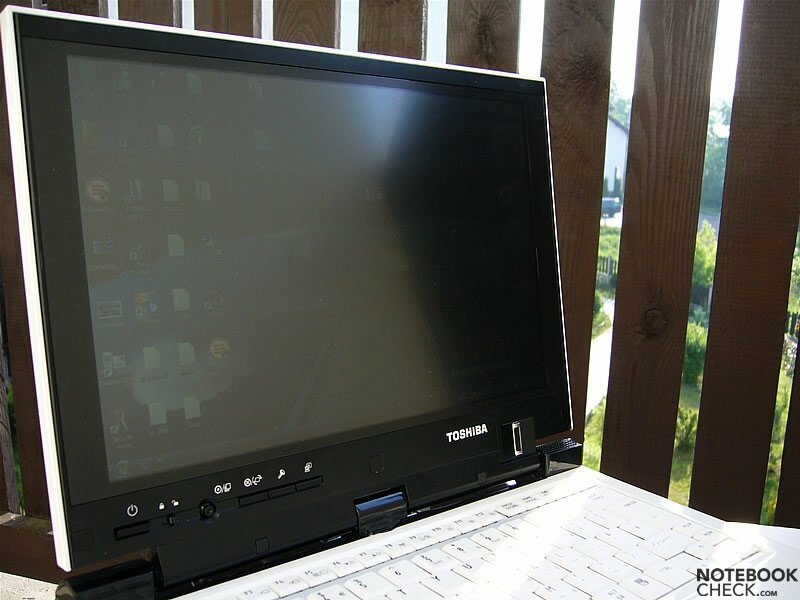 The Toshiba Portégé R400 looks good. 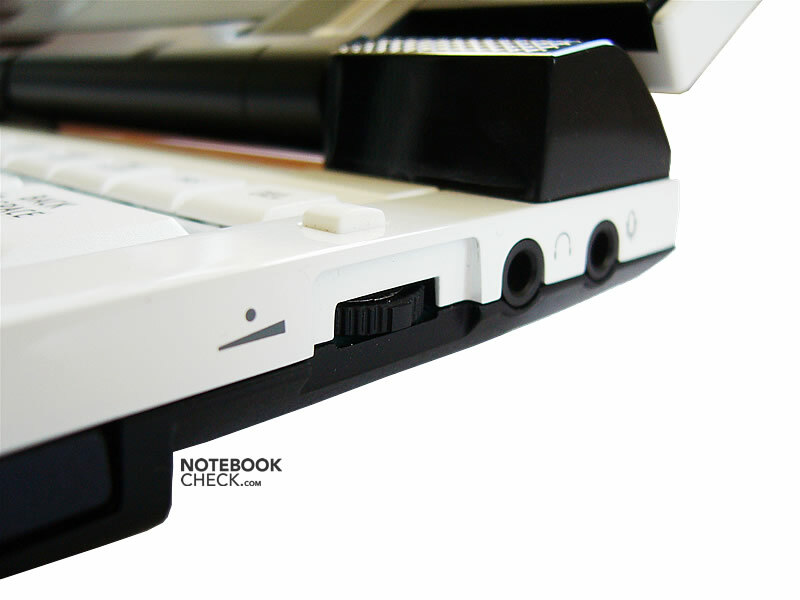 The loose cover of the supplementary battery's socket might irritate, during handling the laptop. The fan is buzzing all the time, regardless of load. As you can see, the white coating easily shows traces of use. 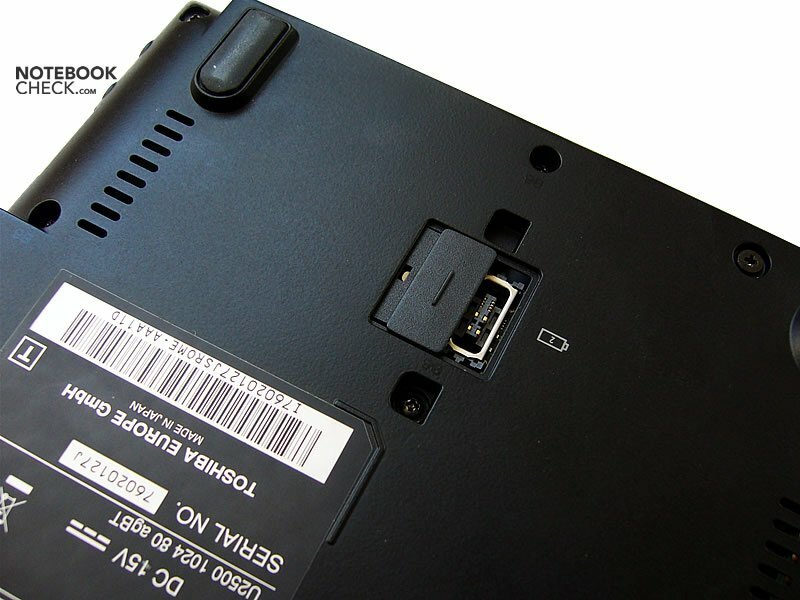 As usual for Tablet PCs the number and variety of provided ports is poor - there are only two USB ports. 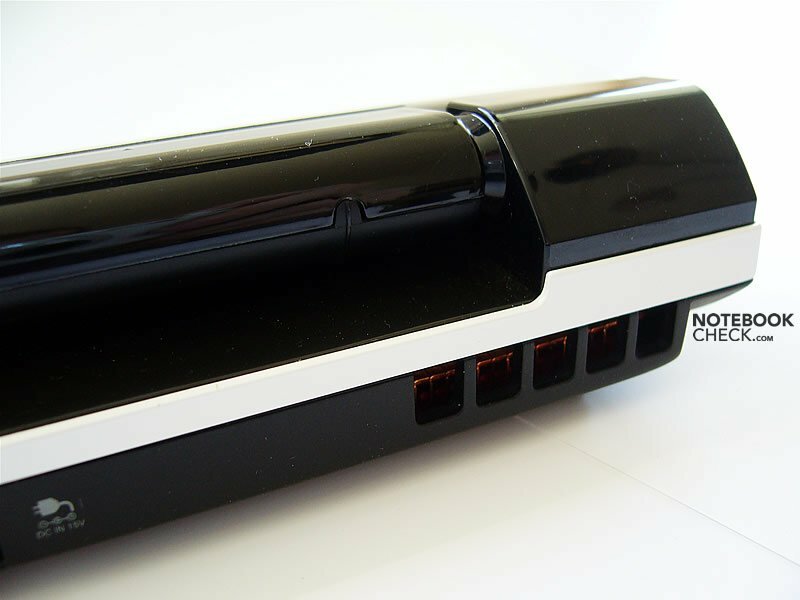 The Wacom stylus is a reliable writing tool which can be easily attached to its port. 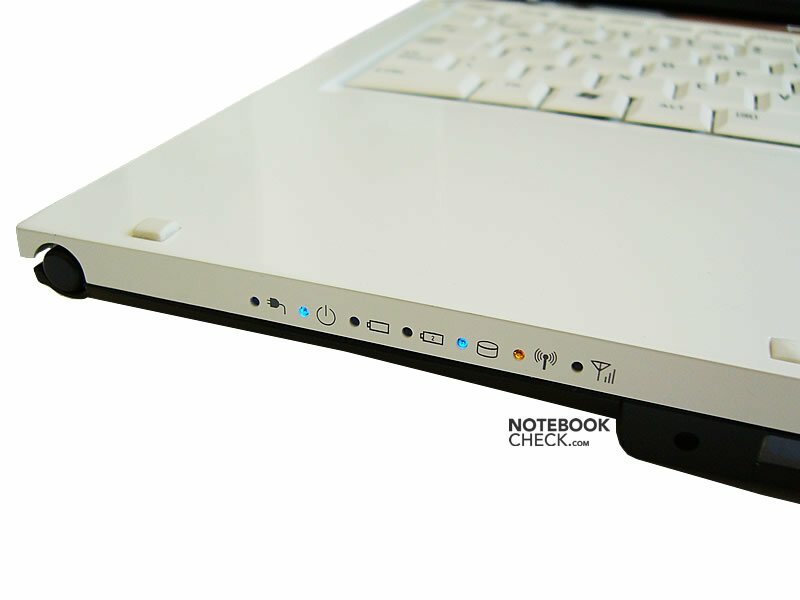 The one-centimeter wide shelf behind the display allows to safely carry the laptop. The lever for toggling the volume is not only striking but also user-friendly. The screen is supported only by one hinge; the two on the sides are mock. 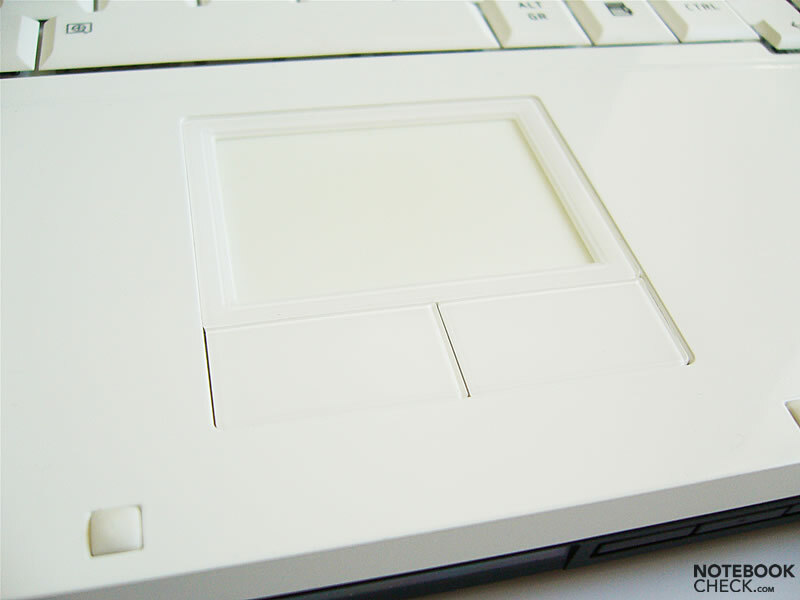 Small power button, besides buttons for controlling the Tablet PC. The left Shift key is uncomfortably small. 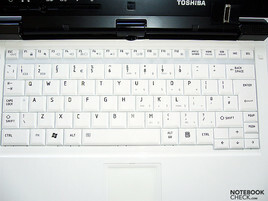 Although the keyboard occupies the major part of the top side, some keys had to be shortened. 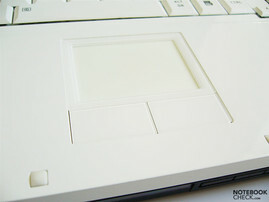 The biometric scanner placed on the molding can also be used while the laptop is in the tablet mode. It is Toshiba's first LED back-lit notebook. 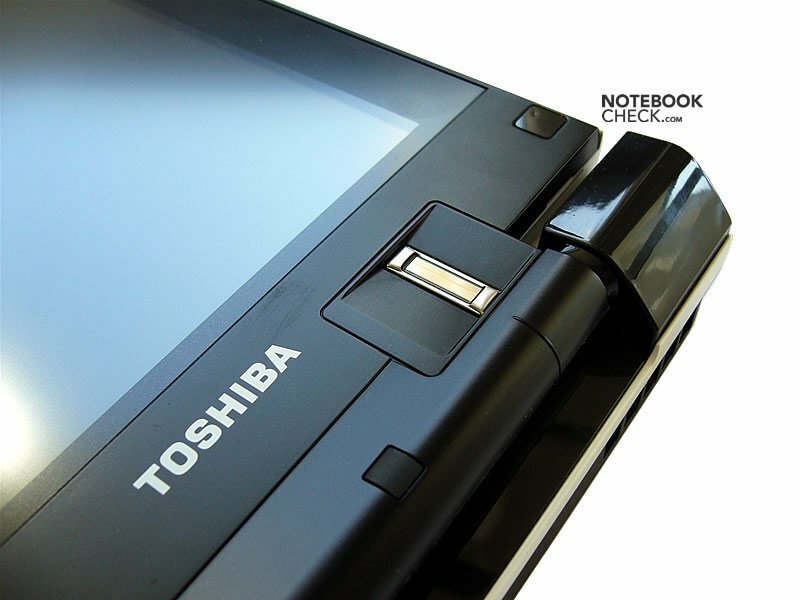 At its front side it provides an auxiliary screen, the Toshiba Edge Display. The white coating of the case reminds on a state of the art fridge. 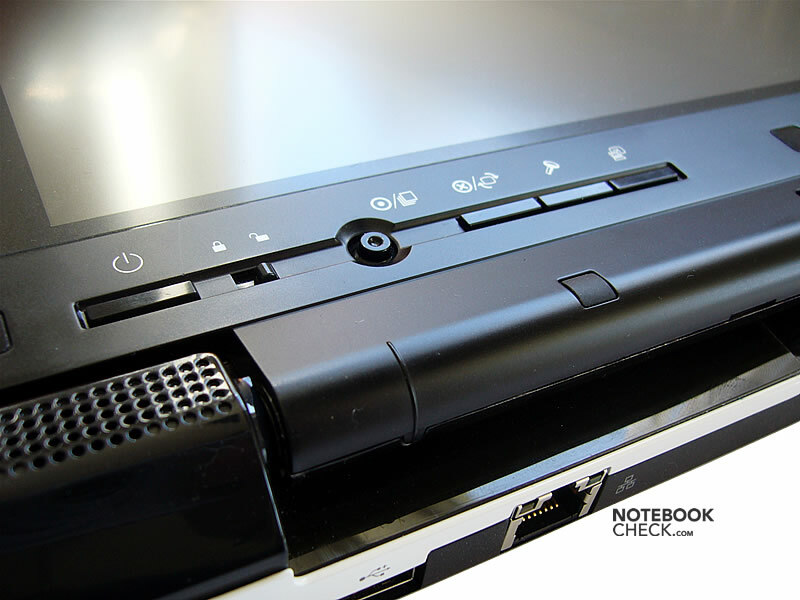 Considering the R400 is a subnotebook, the provided battery runtime did not meet our expectations. 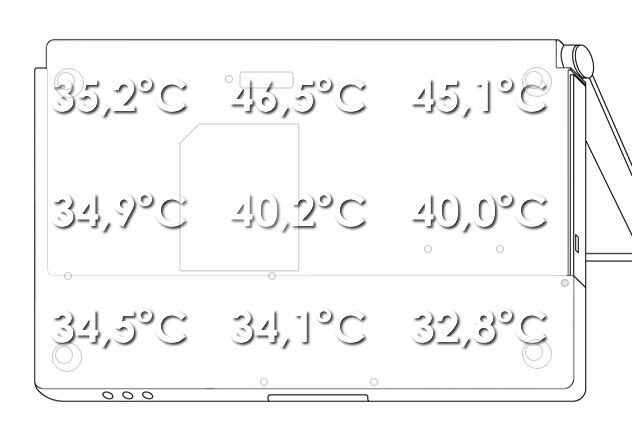 Apple MacBook 13": 13 Zoll variant of the classic design.